What is a “Museum Quality Print”? Also commonly referred to in America as “Giclée Prints” or Archival Prints. According to Fine Art archivists, our Museum Quality Prints will highly resist fading and discoloring under normal conditions for 100-150+ years. This will ensure that your investment in art should last a lifetime. Museum Quality Prints are color matched to the original artwork and printed with the most up to date technology on high quality archival materials that a Museum or Gallery would approve. This is the next best thing to owning an original. Each Museum Quality Print is inspected and approved by Jay Alders before being signed and packaged safely. Limited Editions are available and will be hand numbered and entered into our studio collector records. Canvas Giclée Reproductions are printed with superb color accuracy on thick archival fine art canvas. Gallery wrapped on 1 1/2 inch poplar wood* with colored edges coordinated with the artwork & ready to hang. We apply several coats of archival-grade lacquer to add additional UV & water resistance and protect the surface. Artist hand-brushed embellishment is available on some canvases only which adds brushed on texture and an added layer of protection. Fine Art Paper Giclée Prints are vividly printed on professional grade matte surface thick acid-free fine art stock. They ship rolled in large heavy-duty tubes. Framing will be necessary to hang and display your art properly and we do offer custom framing. Inquire for a price quote. Each print is embossed with an Official Alders Authenticity Seal. Step 1. Choose Fine Art Paper Print or Canvas of an image you love. Step 2. Choose a Size. Still need help? Our FREQUENTLY ASKED QUESTIONS page is a good place to go for pre-sales help. We answer everything you may be wondering but if you still need help, please contact us so we can help you. Solitube is one of Jay Alders' most recognized pieces of Surfer Art. This Longboarder Hanging Ten has been exhibited throughout the United States as well as on Art and Music Tours throughout Brazil. Bring the feeling of the water streaming through your toes with Solitube. Makes an epic gift for any Surfer, Beach Goer or Art Enthusiast. This surfing painting which was first conceived when Jay was asked to paint an original piece of art for the Fosters Belmar Pro 2010 limited Edition Poster. Having spent much of the summer of 2010 away on art tours, Alders craved some time at home to just paint, surf and enjoy beach culture. Thus “Home Slice” became representative of a late summer homecoming. Immediately Jay thought of the rock jetties and greenish-blue waters of the Atlantic Ocean that he spends so much of his time surfing in. This piece really shows the artist's love of geometric and abstracted form. The painterly brushstrokes and impressionistic color palette are a different approach than we are used to from Alders, yet it is still very much in his unique style. The surfer becomes one with the ocean wave as his hand seemlessly creates the breaking wave. The repetitive patterns in the sky and wave face add a graphic design element to this painting which makes it both soothing and exhilarating. No matter how much we travel, there's no place like home. Pot of Gold – Contemporary, art deco inspired surf artwork print. 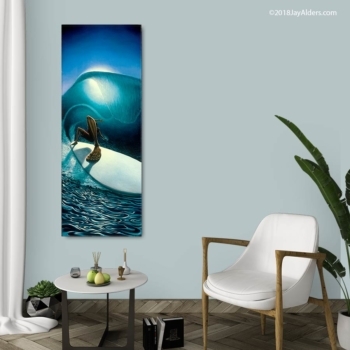 This beautiful piece of surf art by artist, Jay Alders has become very popular amongst surfers around the World. Depicting a female surfer paddling out in tropical waters between sets on her longboard, the viewer can feel the motion of the seas and the wind blowing through the surfer girl's hair. The Coastal hills on the shore create a picturesque setting that draws you in. This original oil painting is now available for art lovers and serious collectors to invest in. This will look awesome in your shore house, beach shack, apartment, dorm or office and makes a great gift.